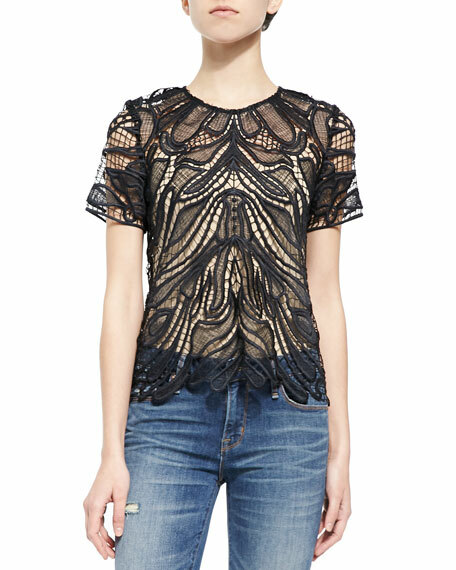 Generation Love top in embroidered netting. Approx. length: 20.5"L from shoulder to hem, 23"L down center back. Model's measurements: Height 5'9.5"/176cm, bust 31.5"/80cm, waist 23"/58cm, hips 35"/89cm, dress size US 2. A New York City brand, Generation Love was founded in 2009 by Roni Hirshberg and Audrey Bressa-Valcourt. Merging their New York and French backgrounds, GENERATION LOVE is a casual-wear line created for effortlessly chic dressing from day to night. As true New Yorkers, the designers created a line for busy city life with edgy laid-back staples.